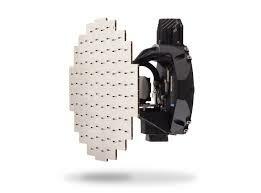 Garmin introduces the GWX 75 Aviation Weather Radar | Avionics Blog – Avionics to the Max! Welcome to the newest addition to aviation weather radars, the GWX 75. This is intended for a wide range of fixed wing aircraft and helicopters. The Doppler-based, solid-state GWX 75 incorporates exceptional range and a new, enhanced color palette that features more color contouring than traditional aviation weather radars. 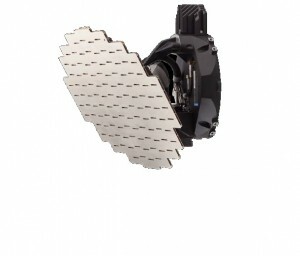 Optional features, such as turbulence detection and ground clutter suppression, are also available with GWX 75. GWX 75 provides pilots an on-board source of weather information to help better analyze convective weather threats, which aids in situational awareness and helps reduce aircraft operational costs. GWX 75 also offers reduced power consumption and extended life compared to earlier generation, magnetron-based weather radars. 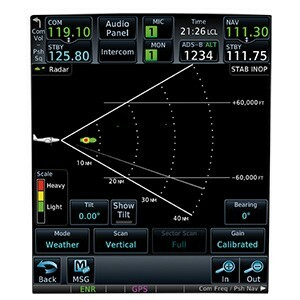 GWX 75 offers a range of 320 nautical miles, horizontal scan angles of up to 120 degrees and to focus on an area of interest — pilot-adjustable sector scanning. GWX 75 also retains vertical scan capabilities, which allows the pilot to focus on storm tops, gradients and storm cell build-up at various altitudes. With the GWX 75, pilots can more confidently navigate around challenging weather with optional features such as Doppler-enabled turbulence detection and ground clutter suppression. Turbulence detection identifies turbulence in air containing certain particulates, such as precipitation, while ground clutter suppression allows GWX 75 to separate radar ground returns and remove them from the display. Additionally, our exclusive Weather Attenuated Color Highlight (WATCH®) technology helps identify shadowing effects of short-range cell activity and highlights areas where radar returns are weakened or attenuated by intense precipitation to allow for more precise weather interpretation. This entry was posted in Avionics News and tagged airplane, avionic system upgrades, Avionics, Canada, doppler-based, efis, Flight Instruments, garmin, glass cockpit systems, GPS, GWX 75, Helicopter, Maxcraft Avionics, navigate, precipitation, tcas, turbulence, VHF radios, WATCH technology, weather, weather radar. Bookmark the permalink.